This picture was taken in 1976 on the occasion of Mr Moss's retirement as headmaster of the school since 1955. 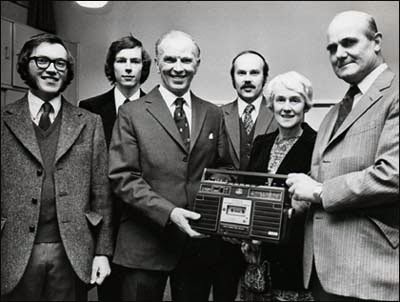 It features, centre, Mr Moss being presented with a radio-cassette player by right, Mr J T Ireland, a school manager and chairman of Bucks County Council. Between them is Mrs Moss, also a former teacher at Eton Wick School. Present for the photograph were Mr and Mrs Moss's three sons, l to r: Stephen, James and Robert. Vernon Moss arrived in Eton Wick with his family in 1955, having previously been headmaster of a small school in the village of Hopton, on the Norfolk-Suffolk border. Over the next 21 years he made a substantial contribution to village life. In addition to term-time operations, he spent many hours at weekends and during holidays raising both standards and funds on behalf of the school. In this he was greatly assisted by a dedicated and supportive PTA. A football pools scheme was launched and enough money raised to build a swimming pool at the school, as a result of which the vast majority of children could swim by the time they left the school. Performance in the 11+ examination improved year by year and by the time Mr Moss retired in 1976, the school had become one of the most popular and reputable in the area. Despite (or perhaps because of) its disciplinary regime, Eton Wick was generally a happy as well as a successful school. The cane was still administered occasionally in those days, but Mr Moss always maintained that pupils never resented their punishment as long as they realised that it had been deserved. He also noted that the pupils who were most troublesome at home often gave no behavioural problems at all at school – and vice versa! Thus it was that he was sometimes wrong-footed when a parent came to complain or apologise about their child. Besides his work at the school, Mr Moss also organised village sports activities for a number of years. Many will remember the annual competitions involving shinty, Danish rounders, darts, table-tennis and shove-ha’penny. Shinty was quite an unusual sport but proved popular among both children and parents, though one or two were liable to swing their sticks a little over-enthusiastically. The final was held at the village fete at the Wheatbutts, while the indoor activities reached their conclusion at the Michaelmas Fayre in the autumn, which Mr Moss also initiated. Mr Moss and his wife left the village in 1980 and moved to South Gloucestershire, where he died in 2001 at the age of 87. Mrs Moss, died in in 2010. I remember Mr Moss as a fair, but strict Headmaster who provided opportunity for children to succeed. I do remember the sting of his cane on the palms of both my hands after being caught doing something that I shouldn't have. He also put me in his 11 plus hopefuls group which I remember was a competitive class as the weekly test results set each pupils seat for the following week. I recall that I only got into the top half for one week. I failed the exam and went to The Orchard secondary modern school in Slough in September 1964. I remember Mr. Moss very well. I started at the school in the Old Building with Mrs. Babris as my teacher, and I recall the daily tasks of lighting the overhead gaslights as the daylight faded in the afternoons, and the coveted job of filling up the inkwells before the first bakelite ballpoint pens were invented. It was quite a competitive school, and when we first learned maths we had to complete "slip tests", and you had to get a perfect score in one test to advance to the next test. Mr. Moss had his own personally taught class for the ten plus and eleven plus candidates, and like Steven says, the person who scored highest got to sit at the front left hand of the class. I remember one time when the "Three Christophers" were the top three, Chris Cowland (me), Chris Seddon, and Chris Harper. I ended up passing the ten plus, was the smallest kid starting the first year at Slough Grammar, and never looked back. Thank you for that, Mr. Moss, you had an iron hand, but your heart was in the right place.